Lots of people want to lose weight. In fact, in Australia nearly half of all adults tried to lose weight in 2016 (and it’s reasonable to assume that this holds true for most modern years). Considering that over 60% of us are overweight or obese, most of them probably failed. Everyone knows that the keys to losing weight are diet and exercise. A lot of people try to only use one of these methods, but for best results they need to be used together – besides, proper nutrition and regular exercise both have many health benefits beyond your waistline. Getting into the habit of exercising regularly can be extremely hard, which is why so many people fail after only a few weeks. If you are aware of this and take steps to get into good habits, you should be able to keep yourself going to the gym. You also, of course, need to do the right kinds of exercise. Dieting is also extremely difficult, but for different reasons. The fact is that when people thing of dieting, delicious recipes are not the first things that come to mind. Instead, we resign ourselves to eating rabbit food and try to mentally prepare for months of starvation – which is a recipe for disaster. However, it doesn’t have to be this way. If you have a solid understanding of the kind of nutritional intake that will keep you satisfied while still leaving you with a kilojoule deficit, you will be well on your way to your target body shape, and will be able to try out some fantastic recipes. Home cooking is the key to making sure you know what you are putting into your body. Yes, restaurant and takeaway food is delicious – but it’s delicious because the recipe uses lots of fats, salts and carbs. When you cook for yourself you can moderate your intake better, and still experiment with different flavours. You need to make sure that your meals are high in protein and fibre if you want to be satisfied and still lose weight. Protein is essential for muscle growth, which will help you burn more energy even when you sit still. A recipe featuring a lot of fibre will keep your stomach full for longer, as this nutrient is hard for your body to break down. Now that you know the basics, here are a few delicious recipes that meet these requirements. If you need more, there are plenty of delicious recipes at HelloFresh. 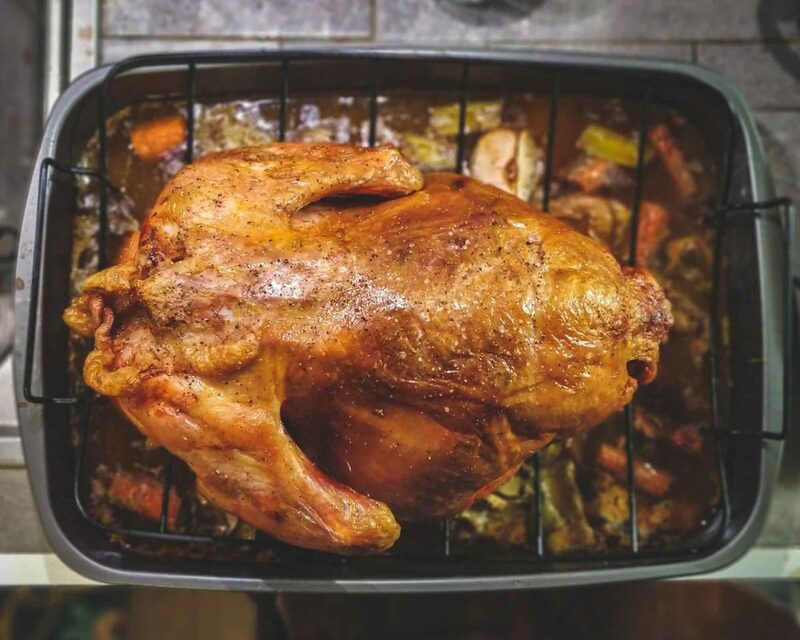 As long as you watch what you cook it with, a roast chicken is one of the healthiest recipes you can prepare. Chicken is a lean meat, meaning it contains lots of protein compared to fat, and with the right vegetables with it you can get a lot of fibre for very few carbs. You will need: a 1.6.kg whole chicken; 1 lemon (sliced); seasoning (salt and pepper at least, but you can use other spices if you like); 2 teaspoons of olive oil; 3 quartered onions (can be brown, red or a mixture); a handful of button mushrooms; 1 sliced zucchini; 1 halved garlic; 1 sliced pumpkin (seeds removed); 2 sliced carrots; 2 sprigs of rosemary; an oven; a roasting pan; and a wire roasting rack. Recipe: Preheat your oven to 220C and grease the roasting pan. Put the vegetables into the pan with the rosemary and mix them around. Place the wire rack over the top. Trim excess fat from the chicken, then rinse it thoroughly in cold water and pat it dry. Season the chicken cavity, then squeeze the lemon over the chicken and rub in the juice. Put the lemon slices inside the cavity and tie the legs together with kitchen twine. Brush the olive oil over the chicken and season the outside. Place the chicken breast side up on the wire rack. Roast the chicken and vegetables for an hour, or until the juice is clear when you skewer the chicken thigh. This recipe should easily feed a family with lots of leftovers, so you can use it as a part of your meal prep for the rest of the week. After you’ve taken all of the meat you want from the chicken, you can use it to make more healthy meals! Chicken soup is another low carb option, and you can fill it with vegetables for extra flavour and nutrition. If you make the stock yourself you will know exactly what is in this recipe! Stock recipe: you will need the chicken carcass; a quartered brown onion; four crushed garlic cloves (three if the cloves are big); your favourite chicken herbs and seasoning (if you forget a seasoning don’t worry, you can always put it in when you turn the stock into soup); a stove; and a large pot. You just put the chicken bones and offcuts along with the onion, garlic, herbs, and seasoning into a pot of water and leave it to boil. That’s literally the recipe. The water will boil down and the flavours will intensify, but that’s ok – you will be diluting it again in soup anyway. The longer you can leave the stock boiling the better, as long as you can refresh the water, but you should allow at least four hours. Once the water is boiled down enough, drain the stock into a safe container and freeze it. Throw out the chicken, onion and garlic. Soup recipe: you will need your chicken stock (if you didn’t have time to make it buy a litre); 1 finely chopped onion; 1 thinly sliced leek (only the white bit); 1 crushed clove of garlic; 1 kg of diced pumpkin; ½ cup of thin cream; seasoning and spices of your choice; 1 teaspoon of olive oil; a stove; a large, deep sauce pan; and a blender. If you have some chicken meat left over that can go in too. Defrost some of your stock and add water to make a litre of flavourful soup. Set it aside for later. Heat the oil in the saucepan and add your leek and onion. Cook for around 3 minutes, until they have softened but not changed colour. Add the garlic and your chosen spices and stir for half a minute. Add the pumpkin and stock and bring to the boil. Turn the heat to low and cover the sauce pan. Allow the mixture to simmer for half an hour, then cool slightly. Blend the soup, in batches if you need to. Then return the blended soup to the pan, stir through the cream and heat. If you have any chicken meat left, add it as well and stir it through the mixture. This recipe should also make plenty of meals, and you can freeze it if you want to. 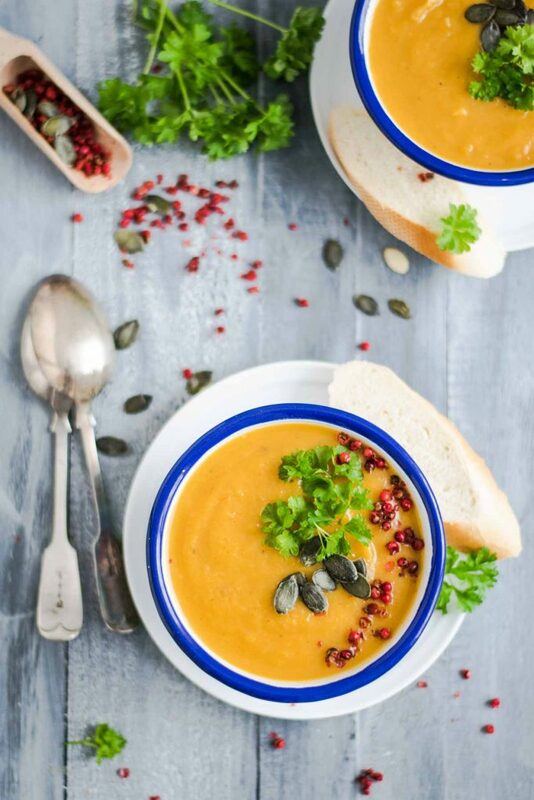 Chicken and pumpkin soup is the perfect work lunch on a cold day as well – and it is both filling and low in carbohydrates!